Did you know in 2017 the total number of cats owned as a pet in the United States amounted to about 95.6 million, according to Statista? Now that's a lot of feline families who need quality products to pamper their cat. That's why Pure-Ecommerce has created this ready-made online pet business catering to the needs of cats and their owners - Introducing MeowtimeMarket.com! This internet business focuses on felines and cat owners will be drawn to the memorable domain name and stylish website design - this great combination is like catnip for online shoppers. They will want to shop here for a great collection of drop ship products including comfy beds, bowls & feeders, must-have accessories, cute cat clothing, cat litter & cleaning essentials, plus fun toys & treats. Our team will get you started by loading the first 300 products, as well as, contacting and gaining approval for the initial drop ship vendors. By working with drop shippers you are able to work from any location without holding any expense or bulky inventory. This is a great option for someone looking to have a little more freedom and flexibility! This is a 100% responsive design website that offers you many outstanding features and will look great whether customers are shopping from their PC, smartphone or tablet. 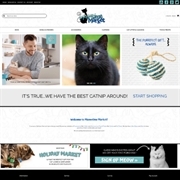 The home page offers a great layout with quick access to product categories, blog, social media pages and eye-catching images to entice cat owners to shop now! You can also reach customers through the connected social media pages where you can share tips for dog and cat lovers, exciting news, special offers and inspirations for cat lovers everywhere! This online store to offers you the "tools" you need to get started including a unique niche market, user-friendly shopping cart, drop ship products loaded of your choosing. Plus, you work with our consulting team as you work through our 10 step process where you will be taught how to set up, run and market your new online business with our 40 hours of ecommerce consulting. Take this website business a step further when you upgrade to our platinum package - you will receive additional services to really jumpstart this business. Do not wait - take the first step and Register or Log In Now for our pricing and find out more on how our team can help you get started! The drop ship vendors are being contacted and when complete 300 drop ship products will be loaded to this website business. Once the site is purchased we will transfer the vendor relationships over to the new owner. We will also give you tips and techniques to research, contact and work with new vendors as you continue to grow the online business. This specialty internet business includes 40 hours of consulting and mentoring to assist you as you become an ecommerce entrepreneur. Contact us now to find out more about this exciting internet business opportunity. •	100% Responsive Design for Optimal Shopping Experience - Make a great first impression with a beautiful responsive design that works well on PCs, tablets and smart phones - Built for optimal search results! •	All New Website Framework - includes page caching system for faster loading, call to action banners to promote sales & products, abandon cart feature, product review features, built-in image zoom, Ajax product filter, one page checkout option, built-in newsletter & blog - a total of 16 modules for optimal marketing capabilities! •	1-Year Access to the Pure-Ecommerce ELearning Library, which Houses Our 10-Step Process – FREE UPDATES! Contact seller for additional information on this site and the exceptional consulting services we have to offer you. 40 hours of Ecommerce Consulting & Mentoring with Pure-Ecommerce.com. This site includes access to our Exclusive Elearning Library and our 10 Step Instructional Program to help you setup, learn to run and market your internet business.